Abstract: This paper proposes an analysis of perfectivity in Russian, which aims to answer the following questions: (1) Why are perfective verbs usually prefixed in Russian? (2) Which classes of prefixed verbs have a compositional meaning, i.e., one predictable from the prefix-verb combination? (3) Which classes of prefixed verbs preserve the selectional restrictions of the corresponding unprefixed verbs? (4) Which classes of perfective verbs take internal arguments obligatorily and why? The analysis proposed in the paper assumes that perfective verbs are derived by affixation of Dowty-style aspectual operators CAUSE and BECOME, and optionally a prefix. Perfective verbs under this analysis vary in their morphological structures, as well as in the syntactic position of the prefix. Different behavior of different classes of perfective verbs is accounted for as a consequence of their compositional interpretation. Abstract: This paper presents a comparative analysis of English and Polish concessive conditionals. In English, concessive conditionals typically involve whatever or no matter what adjunct clauses. In Polish, however, they involve subjunctive mood and what looks like pleonastic negation. The main question addressed in this paper is how, in view of these differences, we can account for the parallelism in interpretation between English and Polish concessives. The analysis developed here shows that the subjunctive mood and negation in Polish combine in a way that yields a semantic contribution similar to the contribution of ever in English. Abstract: Despite a strong correlation between word order and quantifier scope interpretation, Serbo-Croatian cannot rely only on S-structure for quantifier scope interpretation. A level distinct from S-structure, such as LF, and an operation such as LF movement is necessary. Evidence for this position is adduced from inverse scope readings. 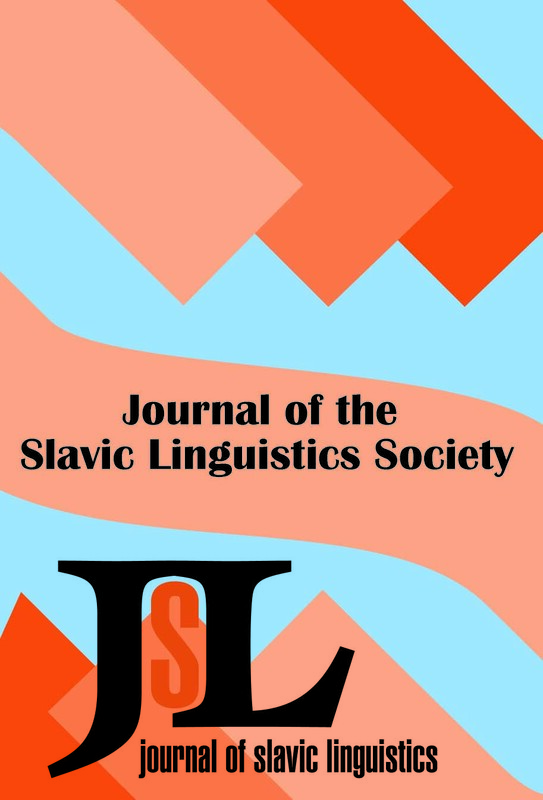 The lack of quantifier scope ambiguity in some examples does not justify the claim that Serbo-Croatian has no LF movement, but it does reveal something important about the interpretation of DPs in Serbo-Croatian: Serbo-Croatian prefers topical interpretation of left-most DPs in null contexts. Abstract: A major issue in the analysis of discourse patterns is identification of the reference of coreferring expressions in consecutive utterances. The relevant questions may be approached from the viewpoint of the degrees of salience of the referents and of the development of these degrees during a discourse. We want to show how an account of salience may use the opposition of word tokens (and their underlying counterparts) occurring as contextually bound (in the topic) or non-bound (in the focus). Is There an "ANTICAUSATIVE" Component in the Semantics of Decausatives? Abstract: The subject of this paper is the semantics of noun phrases (adjective+noun combinations) used in Soviet Russian political discourse. The study has the following objectives: 1) to reveal the semantics of certain types of noun phrases, and the internal relations in them, i.e., the laws and patterns of their formation; 2) to investigate the pragmatic value of these word groups; 3) to contribute to the investigation of general peculiarities of Soviet political discourse. It will be demonstrated that the adjectives under discussion are similar to epitheta ornantia used in traditional texts, especially in folklore. The concept of tautological epithets can be applied to the word groups under consideration because of the proximity or even the coincidence of semantic contents of the noun and the adjective within the noun phrase. The adjective often serves here as an intensifier or qualifier, the classificative function of attribute being absent. The evaluation can be contained in each element of the word group or in both of them. The abundance of such adjectives is a striking feature of Soviet political discourse. They contribute to a certain "monumentalism” of text and provide a ready value judgement of events, the judgement prevailing over the informative content of the texts. Abstract: In this paper Russian decausatives are claimed to be formed from those causative verbs that allow non-agentive subjects, so that the main difference between decausatives and passives is that a decausative excludes participation of a volitional Agent in the concept of the situation. Decausativization is presented as a shift of diathesis, which transfers the Object of a causative verb (with non-agentive subject) to the Subject position but preserves the Causer as an adjunct. The adjunct Causer, if not specified and thus irrelevant, may be deleted by means of a rule analogous to that responsible, e.g., for Unspecified Object deletion. The "Anticausative” analysis of decausatives, according to which decausatives denote a change that can take place spontaneously, is rejected: it is demonstrated that spontaneity of change is not an obligatory feature in the semantics of decausatives. Abstract: In the context of the verbal aspectual forms referring to the situations which came to an end before the moment of speaking, the Russian adverbial davno ‘long ago’ is always the rheme of the sentence. The rhematic bias of davno is accounted for by the semantic parameter ‘remote in time from the speaker’. Meanwhile, in the context of the verbal aspectual forms referring to the situations which persist up to and including the moment of speaking, davno is not obligatorily the rheme. Another semantic parameter which influences the theme-rheme structure is the meaning ‘below the norm’. The parameter ‘below the norm’ determines the communicative function of the Russian adverbial nedavno ‘recently’: it is the rheme in the context of the verbal forms which refer to situations taking place over a long period of time. Thus, I hope to demonstrate that whether an adverbial belongs to the theme of a sentence or it can solely be the rheme may depend on the meaning of the verbal categories.